I’m jumping from the bedroom to the dining room today because yesterday Jim and I had to clear everything out of the dining room in order to repair the ceiling. 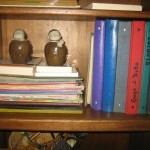 This interruption to my plan uncovered numerous items tucked away in corners and behind bookshelves. A room that I hadn’t considered cluttered revealed some hidden treasures but also useless items and more questions. For example, should I keep the 16 year old x-rays of my back? What about those protest signs against war, for health care reform, for church reform, and pro-life? Then there are the 101 used folders and 24 three-ring binders that I saved so I wouldn’t have to run to the store every time a child had a school project. Wait! It’s been six years since our youngest was in a local school! 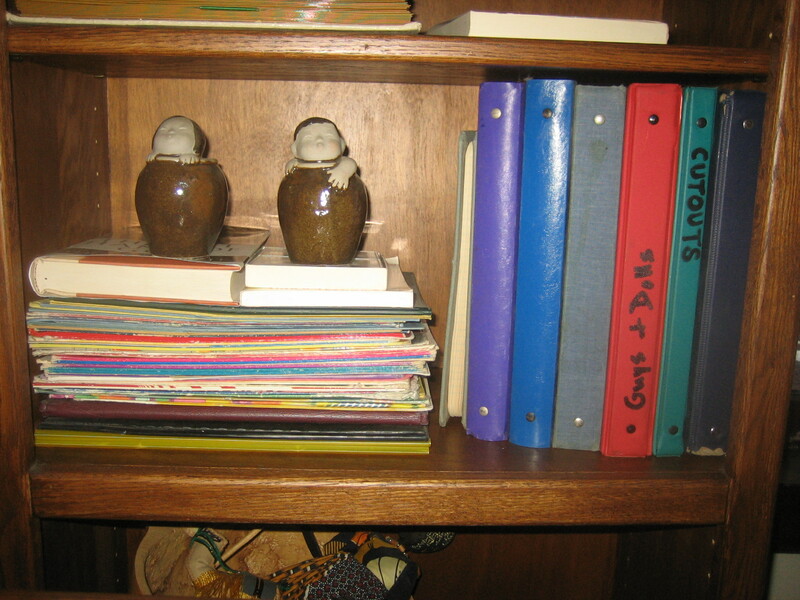 What you see in the photo is about ¼ of the folders/binders. Some I put into recycling, better stuff I’ll give away, some I’m just moving to a different place in the house for a later decision. I’m not sure if this is progress.